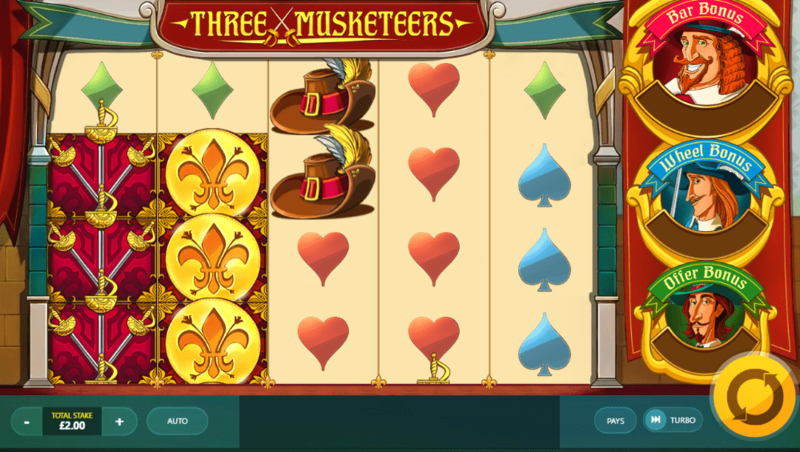 This is one of those online slots UK that take on a rather ambitious and potentially very funny theme and completely pulls it off, as Three Musketeers involves all of the swashbuckling action that you would expect from the French noblemen. A great soundtrack and some even better bonus rounds, make this classic French themed slot a popular choice from Red Tiger’s comprehensive selection. Red Tiger Gaming always delivers when it comes to their online slot games to play and for the most part, this is down to their exceptional graphics. Regularly taking on fun themes and crafting creative narratives with them that breed great bonus features, Red Tiger is carving out a fine reputation within the slot game realm. They pull off this theme well and for similarly entertaining and fun games from Red Tiger, check out Penguin City. As mentioned, the game uses the famous Three Musketeers as it’s the focal point and uses the trio of French noblemen to good effect. Swords all over the place, the heroes provide some great comedy to the narrative of the slot game and are welcomed additions to the game’s quirky soundtrack too. Test your luck as you emerge to win the best spin slots today! Calls of French sayings in great accents add a sense of comedy to the proceedings here, which is always welcome whilst you spin the reels. Whenever one of Porthos, Athos or Aramis lands on the reels, calls of “Bonjour,” “Salut!” and ‘Tres Bien” can be heard as clear as day. As for the lower paying symbols on the reels, tankards of delicious ale, hats, sharp swords and a fleur de lis will pop up. The latter is the most rewarding of these relics, as landing 5 of them will get you a grande 200 coin payout. Three Musketeers comes with wild symbols and these are capable of swapping in or out for any other symbols to form any winning combination. Also, the Musketeers in question can provide you wilds, too, so let’s hope they are on your side. Landing 3 wilds on a single pay line will reward you with a very impressive 60 coins, but this is bettered by the landing of 4 or 5 of them which gets you a huge 120 or 300 coins respectively. 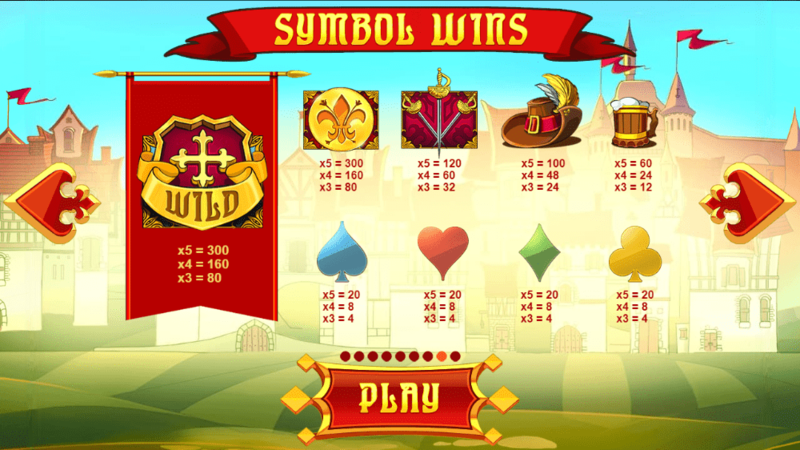 Collecting Musketeer symbols is another way to stack up some coins, as it increases the chances of landing wilds. Look out for a Bar Bonus, a Wheel Bonus and an Offer Bonus feature, too, as these add some variety to the gameplay on the occasions that they pop up. There seems as if there’s a lot going on in Three Musketeers, but flowing gameplay and a smart layout makes everything feel very simple and easy to work with. The Three Musketeers delivers everyone that you would want from an online video slot game.